Guest bloggers John and Sandra Nowlan report on their visits to Excellence Rivera Cancun and Finest Playa Mujeres (both resorts are part of the Excellence Group). Our pedicures came with an unexpected bonus – champagne and chocolate covered strawberries. We were in the modern, well-equipped spa at the Excellence Riviera Cancun resort on the sunny Caribbean coast of Mexico. We chose a couples pedicure and were seated comfortably with our feet in soaking tubs when our therapist arrived with flutes of champagne, fresh strawberries covered in chocolate and a broad smile. It was wonderful (oh, and the pedicure was great, too). Excellence is a small, luxury Spanish owned resort chain that has become a Caribbean favorite of ours over the years. With our visit this time we were able to sample both the adults-only concept at Excellence Riviera Cancun and, just up the coast, the new Finest Playa Mujeres, aimed at families. We flew non-stop to Cancun from Toronto (with an overnight at the convenient and comfortable Sheraton Gateway Hotel in Terminal 3). Getting through Mexican customs seemed easier than ever (they’ve become very efficient at processing visitors) and we were soon going through the security gates at the Excellence resort. Excellence Riviera Cancun has a sumptuous lobby, 440 large, air conditioned suites laid out in a series of low rise buildings surrounded by meandering pools. Our suite, like all the others, had a full marble bathroom, an oversize Jacuzzi tub, large screen satellite TVs with DVD and a fridge and liquor cabinet stocked with complimentary beer, wine and top shelf spirits. We’ve always enjoyed the food in Mexico and Excellence Riviera Cancun sets a very high standard. Even the buffet restaurant, Barcelona, has white linen and flowers on the tables and often live music to accompany its Mexican and international cuisine. The other eight a la carte restaurants (no reservations needed) provide a relaxing atmosphere and a great variety of choices. There is a wine list (extra cost) but the complimentary house wines (usually a better Mexican vintage or one from Chile) are excellent. The waiters all speak fluent English and are well trained in the art of fine dining. On this trip we were especially pleased with the Indian, French and Mexican specialty restaurants. Excellence even brought a top chef from India to oversea its Basmati dining room. Well-stocked bars are scattered over the property, even one specializing in non-alcoholic smoothies. After a couple of days of pampering at Excellence (including delightful swims in the ocean and pool) we traveled a short distance north of the city of Cancun to the Finest Playa Mujeres. This 450-room contemporary resort, owned by the Excellence Group, is the first venture by the company into the luxury family concept although it also includes an adults-only section. Every suite is large by Caribbean standards (at least 800 square feet) and features all the Excellence amenities plus a double size shower stall with both a traditional and rain shower and a family size Jacuzzi adjacent to the balcony. Some first level rooms have a private plunge pool by the sliding front doors and others include a large rooftop terrace with pool and bed for sunning or star gazing. 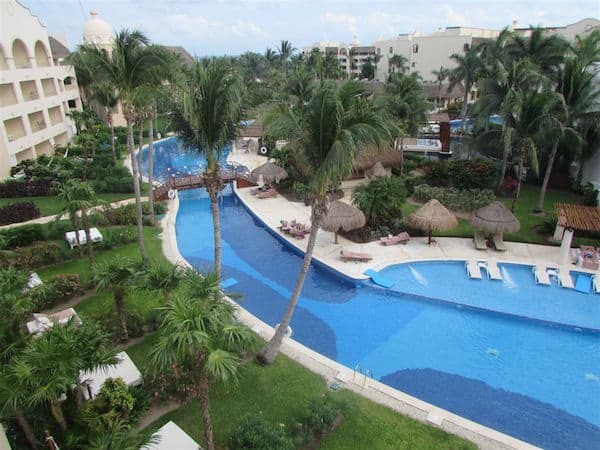 The layout is very similar to Excellence Riviera Cancun but the architecture is much more modern (some have criticized it as being too modern and less Mexican) and, in the family section, there are many facilities for children (including a small water park). The spa at Finest features a fascinating Aqua ritual that we both enjoyed. Your total body is stimulated at different stations using water with changing temperatures and pressures plus therapeutic mud, an ice room, thermal showers and massage beds. The cuisine at this seaside resort is every bit as good as that at the adults-only Excellence. The nine restaurants include French, Italian, seafood, steak, pizza and tapas. But the main buffet restaurant, called the Market Kitchen, is the largest and best laid out buffet we’ve ever seen. Never crowded, it includes a low level section just for kids to indulge their tastes and a Mexican Corner where delicious specialties from our host country are available for all to try. We discovered that a Mexican breakfast, including chilaquiles, corn tortillas with salsa, cheese and onions and Mexican hot chocolate with cinnamon, is particularly tasty and filling. Safety is always a concern in Mexico (sadly, drug gangs are still part of the culture in some parts) but at both resorts we felt very confident that security and guest comfort were a key priority. The Mayan Riviera, around Cancun, is especially safe because the area relies so much on tourism. Security on resorts is taken very seriously. We enjoy travelling in cold months to both Cuba and the Dominican Republic but the best cuisine (very important to us) is always found in Mexico. We can’t wait to go back. *John and Sandra Nowlan are travel and food writers based in Halifax. Disclosure: The Nowlans stay was hosted by Excellence Resorts but any opinions expressed in this post are their own.